New Delhi: The Central Bureau of Investigation (CBI) closed in on Nirav Modi on Monday, asking Interpol to issue a red corner notice against the fugitive billionaire who masterminded the Rs14,356 crore fraud at Punjab National Bank. If Interpol accepts the request, Modi can be arrested by the police of any country. While some news reports say Modi is holed up in London, CBI officials deny any knowledge of his whereabouts. Modi’s potential arrest and return to India would help investigating agencies uncover the way the fraud that threatened to undermine the banking system was committed. “The request for issuing a red corner notice against Nirav Modi and Mehul Choksi has been sent by CBI to Interpol. As of now, CBI is unaware of Nirav Modi’s whereabouts. The moment his whereabouts are confirmed, further and adequate action will be taken," said a person familiar with the developments, seeking anonymity. While India’s ministry of external affairs denied having received an extradition request—either from CBI or the Enforcement Directorate—officials from the Union home ministry and the UK’s home department met on Monday, with the latter assuring support to India in its extradition requests for liquor baron Vijay Mallya and diamantaire Modi. “We had a fruitful meeting. 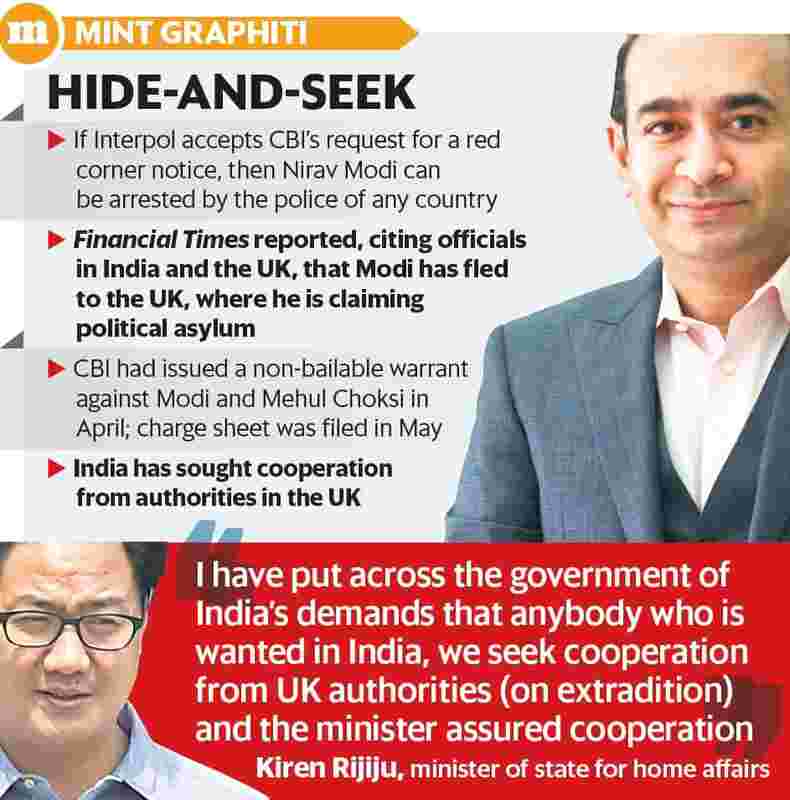 I have put across the government of India’s demands that anybody who is wanted in India, we seek cooperation from UK authorities (on extradition) and the minister—Baroness Williams—assured cooperation whether it is Nirav Modi or Vijay Mallya," Kiren Rijiju, minister of state for home affairs, said in New Delhi. Modi’s lawyer did not respond to Mint’s calls seeking a response. A Mumbai sessions court issued a non-bailable warrant (NBW) against Modi and his uncle Mehul Choksi, a co-accused, on CBI’s request in April. ED moved a sessions court in Mumbai on Saturday, seeking an NBW against the duo. CBI has also requested Interpol to issue a red corner notice against Choksi. Though Modi, in several e-mails to CBI, has stated that he was unable to join the investigation, Zulfiqar Memon, managing partner of law firm MZM Legal, said Modi has a fair chance to put forward his defence in the case and the fact that he fears for his life and reputation, the damage of which is irreversible if he is extradited. “The Indian government faces a tough task ahead. In the event of failure on the part of the government of India, the British courts can also award damages and compensation to Modi as has been done in the past in other cases," says Memon.